It is time for the vintage pattern contest at Pattern Review. This time I was going to participate in a contest that I wanted to. I am always needing to make more separates so I decided to make Butterick 3513 from the mid-1960’s. It was between this or a similar Vogue 7403 from mid-1960s too (probably 1967). 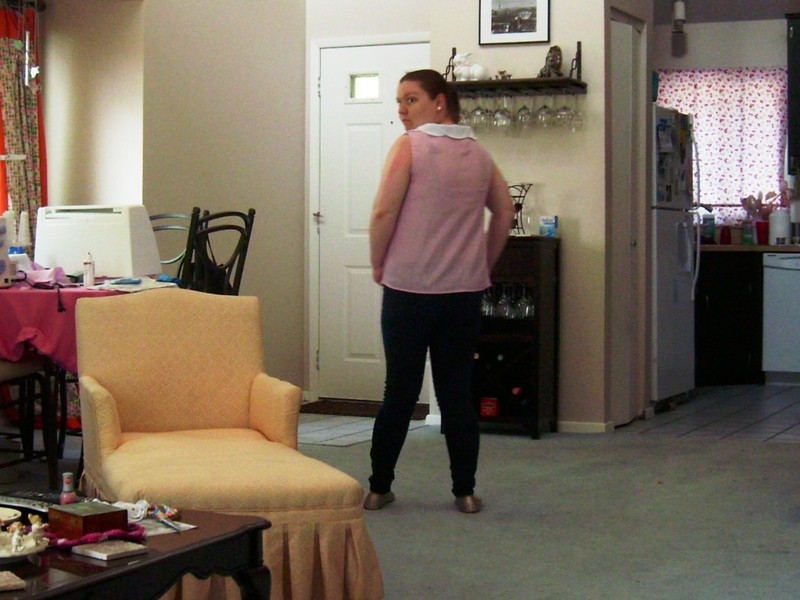 I made the sleeveless scallop collar in view C since I love to pair items with a cardigan for work. The handkerchief linen is see-through (maybe not the best for a unlined blouse). I will have to wear a camisole under this for sure. Otherwise, any future tops from this fabric will have to be lined. 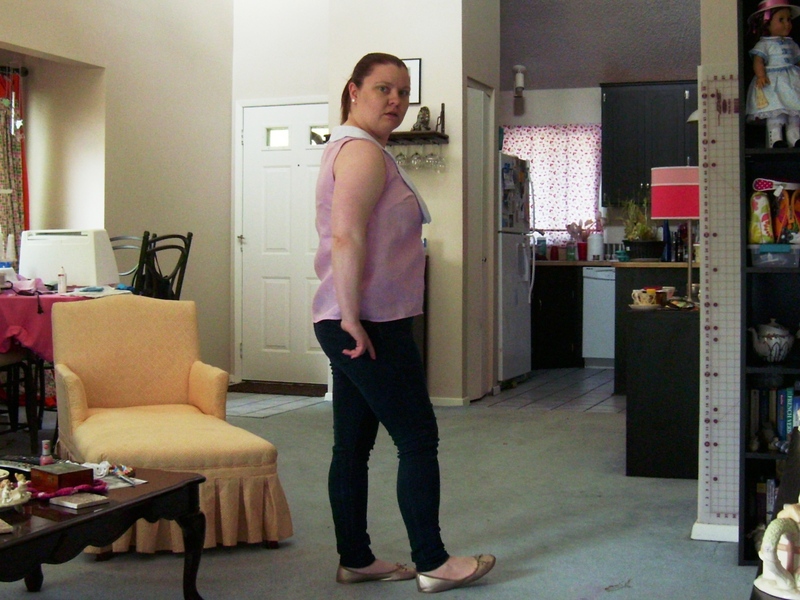 This blouse pattern was pretty much straight up and down at 40 inch circumference. From that I figured I should be ok in the bust area, fine at the waist and lacking width in the hip area. 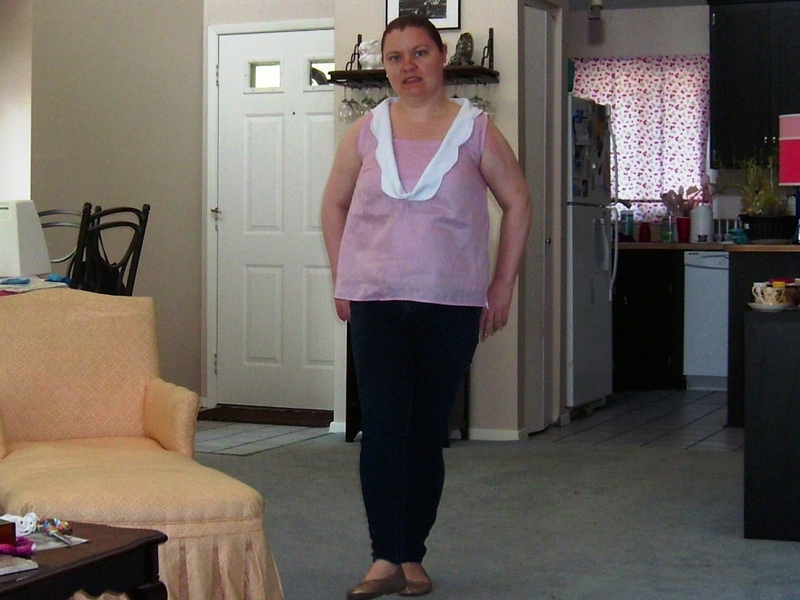 I did shorten the blouse by an inch in length. I used the seam hinge pattern alteration method again. This time I added 4 inches to the bottom at the hips and tapered back up to nothing at the arm. Before I even cut the fabric out, I was concerned that the linen would fray a lot. So, all edges were run through the serger machine. For some unknown reason, my pinking shears went missing. I can’t find them anywhere that I have thought I could put them. They will probably show up after I go and get a new pair. It would have been nice to have them for trimming the neckline area. I basted the left side together and tried it on hoping that I would not need to install a zipper. But after trying it on, I realized I do need the zipper. Also from the first try-on session, I realized the arm is too tight and I felt like I was falling out of the top in the front. The dickey is a must. I did not want it to be removable. I am afraid removable may mean a wardrobe malfunction. I took about a half inch off the armhole on the top. I used bias to finish the armhole for less bulk and less to show through the linen. Also, I hand stitched the neckline facing down. If I make this pattern again, I will definitely not shorten the length at all. I would also adjust the arm area and possibly add some more to the bust area. This pattern should have been my entry for the “Inspired by the Movies” contest at Pattern Review. But instead I will just join A Stitching Oddessy’s Vintage Pattern Pledge. So it is official, I, Char at Sewbeading, promise to make at least 5 items from vintage patterns in 2014. Here is entry one for the Vintage Pattern Pledge. I have more friends getting married next spring. I swear I am going to wear this dress to both weddings. One is in Colorado and the other is in Kansas. No one except for my blog readers, the bride of the second wedding, and maybe the groom from the first wedding (if he remembers I mentioned it) will know. A must for this new dress was that it needed to have that late 1950’s/ early 1960’s feel and full skirt. I decided that a special occasion dress should be made out of silk. In fact the color I picked was called cranberry zinger. My pattern was a size 36 bust. I made a cotton muslin to check the pattern size. My first inclination was that the waist is going to be too small. After making the muslin, I decided it needed at least a couple of inches in the waist and needed to be lengthened an inch also. I tried a new pattern alteration the seam hinge method. I had seen this sort of explained at the sewing expo in November. I lengthened the bodice 1 ¼ inches. I then added my width adjustments. Afterwards the first adjustments seem to be fine; it looks like a better fit. But with the fashion fabric being silk, I went ahead and made a bodice muslin. The muslin seemed to be fine. After the navy dress, I went back and took a half an inch out of length on my bodice pieces. Even though the muslin looked fine, the skirt of the dress did weigh down the bodice enough that it was too long. Since I made the dress out of silk, I thought the dress should be lined. 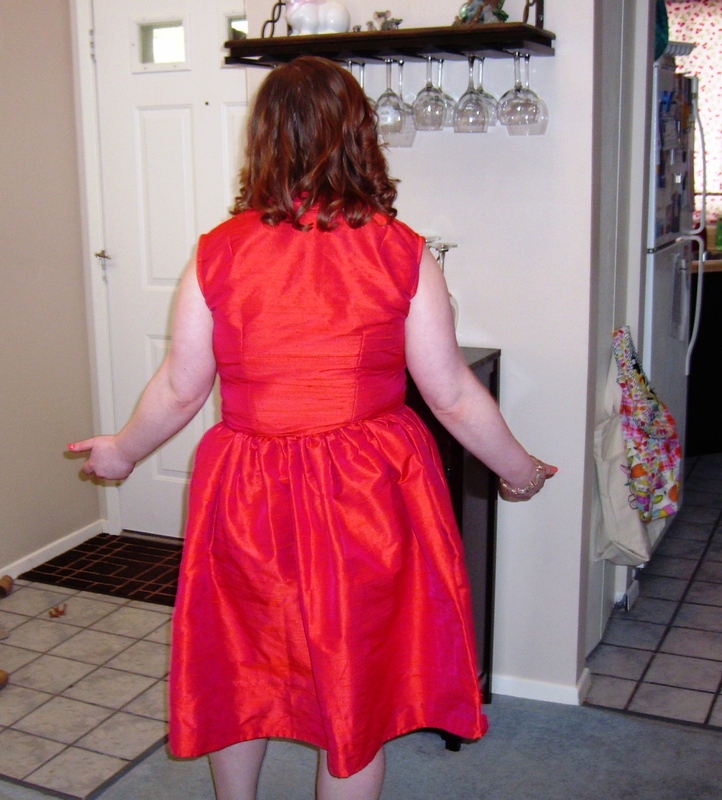 On my previous silk dress (Vogue 8789), the waist was a little chunky with the dress seam and the lining seam. I decided to line the bodice of the dress only to hopefully avoid this problem. The silk duiponi feels like it should be alright without a lining in the skirt. Otherwise, if not, I have my half slip (Simplicity 4218) from the stretch silk charmeuse which was recently completed. I used the front and back neck facings but not the armhole facings. Since I did this, I was able to baste my lining to my fashion fabric then sew on my facings and collar. I just used the sewing machine and tacked down the facings instead of hand sewing them like I normally do. It worked out well. I was disappointed with the fullness of the navy dress skirt. I envisioned something more which is what the pattern envelope made me believe. So I did change that a little on the cranberry silk one. I kept with the two panels but I cut the whole width of my fabric instead. I probably added about 20 more inches of fullness to the skirt. I like this better. One interesting item to note, during this project I learned that Lala loves the feeling of silk under his bottom. I repeatedly had to move him off my fabric as I was working with it. But the funny thing is that one night there was the rose knit fabric on the floor next to the cutting mat and Lala never put a paw on that. But he sat on the silk I was gathering for the skirt instead. Next major project will be my entry into Pattern Review’s vintage contest. I have Butterick 3513, a blouse from mid-1960’s with a scallop collar in orchid handkerchief linen. A side note, I have joined Bloglovin for anyone who wants to follow me on that. I have my dress completed but am still waiting to take pictures of it. I plan on posting it next week. 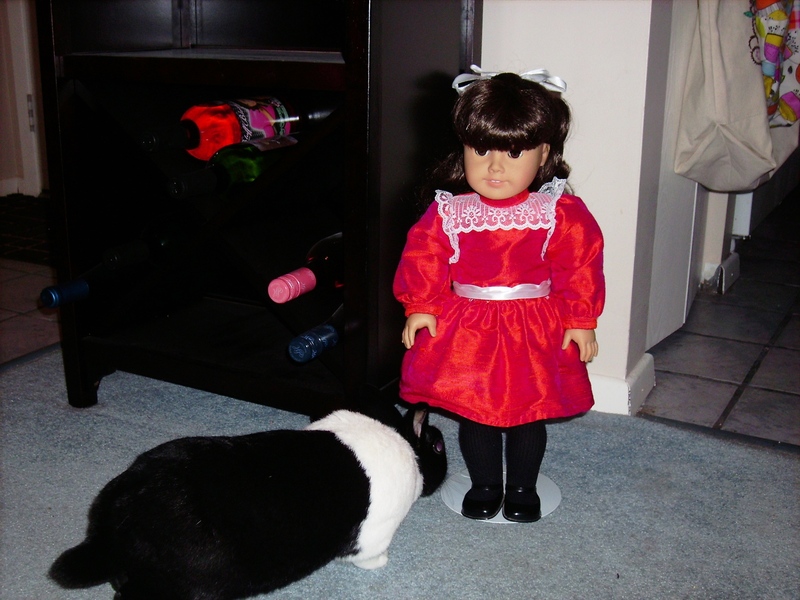 Until then, I have another doll dress for you to see. When you spend about $30 on a piece of fabric, you have to use it all up especially when it is a beautiful color. I still had some silk left after making my dress. I have to use it all up. 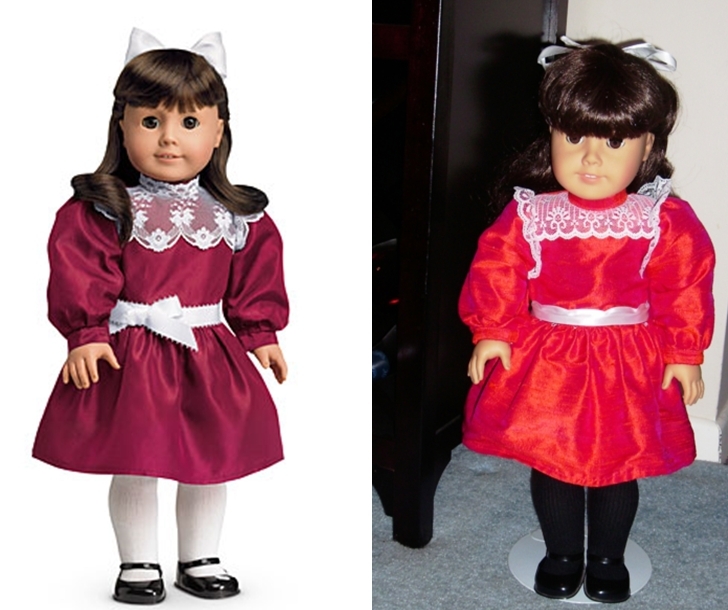 So besides Marie Grace and Cecile getting a skirt to share between them (I am saving that until I had completed a couple more items from Butterick 6035), Samantha got her Christmas party dress. I used the Pleasant Company pattern. All the pieces were easy to cut with the rotary cutter. Actually, if you have a 54 or 60 inch wide fabric you could probably get away with just about a quarter of a yard. 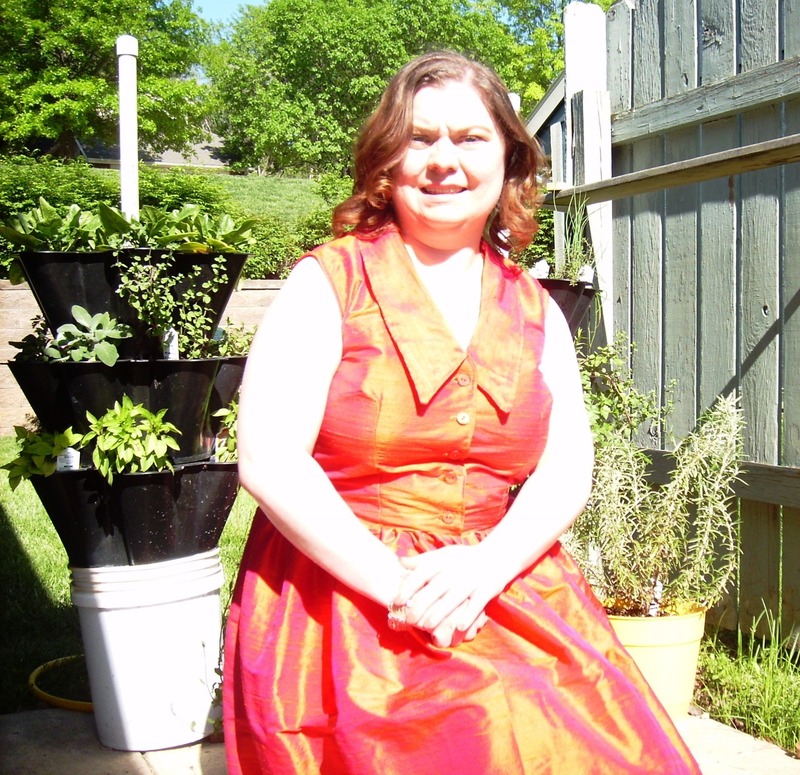 I did use my serger on the dress because I didn’t want my silk duponi to un-ravel. I didn’t put the lace on the neckline. But I did use the lace for the sleeve ruffle. I had one and one quarter-inch lace not the one and three-quarter-inch lace recommend. For the waist sash, I used plain half-inch satin ribbon instead. At the fabric store, the only picot edge ribbon was less than a quarter inch. I think a lot of changes have been made to the trim departments in the fabric stores. So if anyone decides to make this, be prepared to change the ribbon and lace as necessary and for the trim to cost more than the fabric you use. 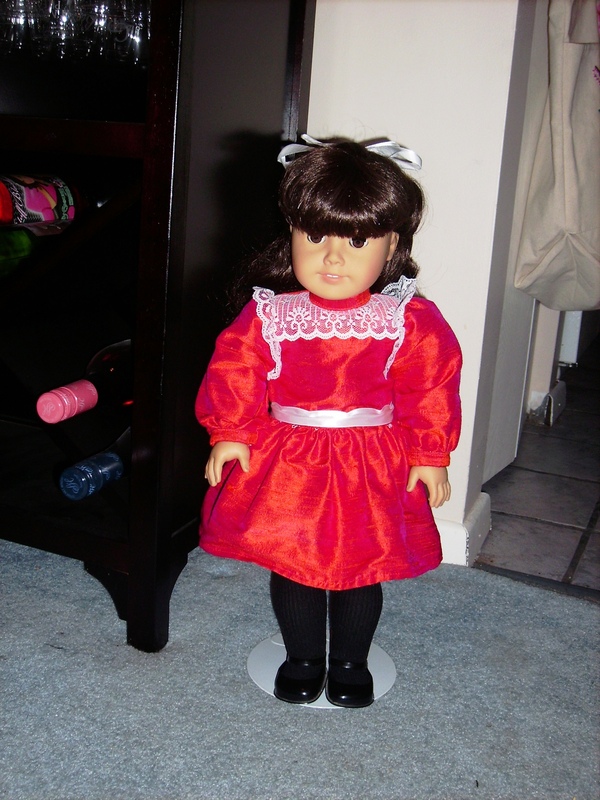 Over half the cost in making this dress was for lace and ribbon. The bodice pieces went together very well. The directions are not very clear for the neckband. I thought I would be folding the short ends in for a clean finish and leaving a quarter-inch at the end on the bodice. If I followed the directions correctly, the directions had one attaching the neckband across then afterwards folding the short ends in when you finish the opening. The sleeve ruffles directions were confusing. It felt like there was too much ruffle for the sleeve when I gathered a 10 inch piece of lace to 4 inches. I didn’t follow the instructions. Instead I took the 10 ¼ inch piece of lace and basted it to the sleeve. Then I gathered the sleeve and attached it to the bodice. I don’t really like how I did the sleeve ruffle. I wished I had cut 4 ½ inch piece then centered that over the shoulder seam of the bodice and basted it to the bodice instead. Other than dislike of the sleeve ruffles, everything went together well. I did go ahead and catch the white sash ribbon in my back seam. So it would not slip and slide around, I put a couple of hand stitches in the ribbon to keep everything in place. Estimated cost of this dress is $10. I have at least one more project with this fabric planned. It is Felicity’s school jacket but it will have to wait until I purchase more thread.